unidentified person, Captain Sjunne Olsson. Hilmer Lundbeck Jr was the son of G Hilmer Lundbeck Sr.
G Hilmer Lundbeck Sr represented SAL in the U.S. from the start in 1915, at Nielsen & Lundbeck, in a basement at 24 State St, NYC, long before the office moved to 636 Fifth Avenue. He was "Mr Swedish American Line" in the United States. 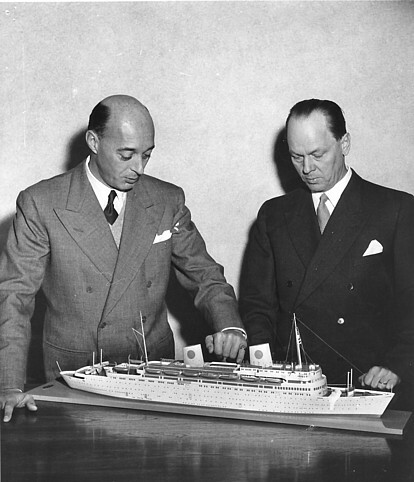 After WWII he was succeeded by his son, Hilmer Lundbeck Jr, who had been originator of the cruise business. D203. Late 40's or early 50's. Dawe on the right. Other name to be added. studying a model of the Kungsholm of 1953.
playwright and author of "Our Town" (to be confirmed). Many thanks to Bob Zeschin for this update. 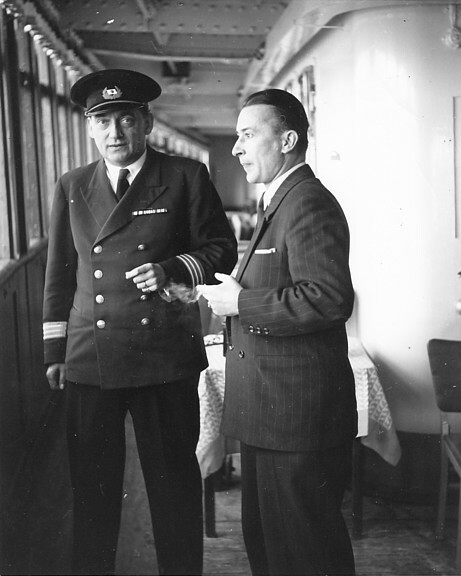 Dawe's predecessor Chief Purser Hugo Bilén and actor George Raft. D220. Curt Dawe and Mr Tune, who was a UK agent for SAL. I believe the unidentified person in D220 (wearing the bow tie) is Mr Tune who was a UK agent for the Swedish American Line. 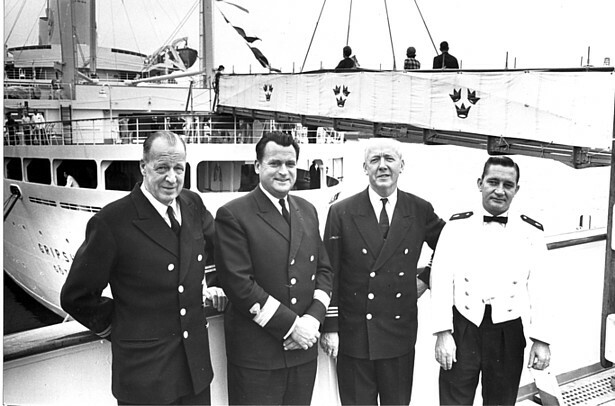 My father was the ship's agent in Weymouth (Cosens and Co) when the Kungsholm and Gripsholm used to visit during the 1960's and 1970's on their Spring Adventure Cruises. It may be of interest that my parents and I were part of a small troupe of entertainers who performed dressed as Pearly Kings and Queens when they visited Weymouth. These concerts were organised by my father Mr Sidney Davis who was very involved in amateur choirs and theatre at the time. My father, mother and myself were always so well looked after on board the Kungsholm and the Gripsholm and it became quite a highlight of the year when they visited. Dinner on board was so special. 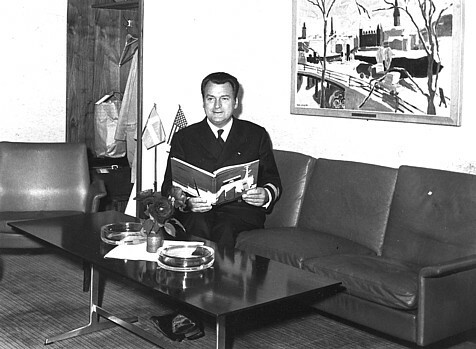 I still have many menus and other SAL valuable items which were presented to us ...including pieces of Swedish glass with the SAL logo, various plates depicting old sailing ships and a model of the Gripsholm. 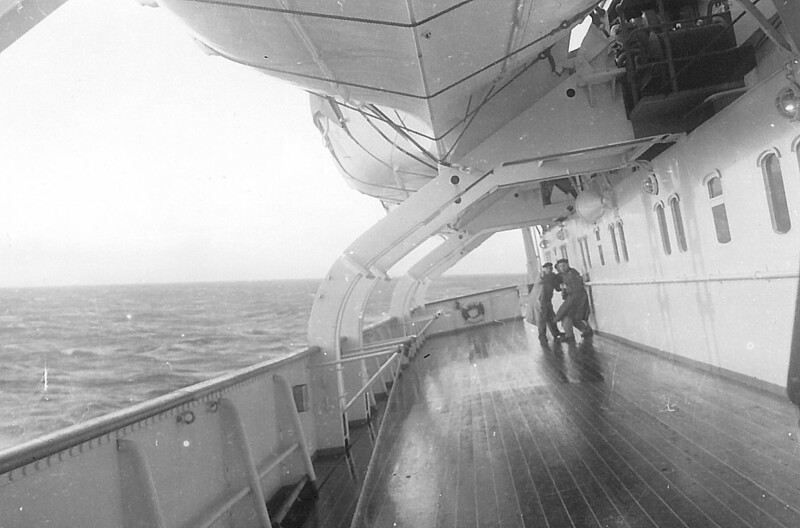 I have many fond memories of these evenings spent on board. In 1968 I visited The USA and Mr and Mrs Hallengren (he being a Swedish American senior manager) very kindly hosted my visit whilst in New York. Many years later my husband and I met the Hallengrens again at their home in Florida after he had retired. 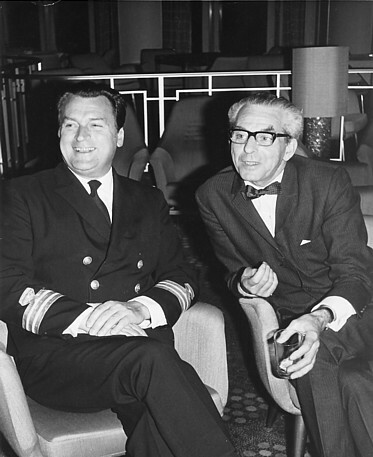 My husband at the time was the British Naval Officer based at Cape Canaveral on a submarine missile programme. Carl Hallengren and his wife gave me a wonderful time in New York ......including visiting SAL offices and a memorable dinner at a restaurant called The Forum of the Twelve Ceasars where they entertained a Swedish Eye Surgeon and his wife who we met off the liner SS France and took them to their penthouse suite at a hotel in New York which name escapes me at the present. The eye surgeon was visiting the US for an operation to save his sight and normally sailed SAL ....one of the companies regular and valued guests. Also remember visiting a Dr and Mrs Block at their home in the city. The reason being they had been passengers on that years' Spring Adventure Cruise and my father had struck up a friendship with them telling them of my impending visit to the US later that year. It was 1968 and in those days a tourist could only take £50 into the US which even in those days would not have lasted me very long!!!! Dr Block suggested to my father he may like to give him an envelope containing US dollars which I could collect from him on my arrival. The Hallengrens and I turned up at their home and I was handed the envelope my father had entrusted him with. Happy Daysand oh so happy memories!!!!! D208. Gothenburg 1965. Kungsholm and Gripsholm were docked stern to stern. 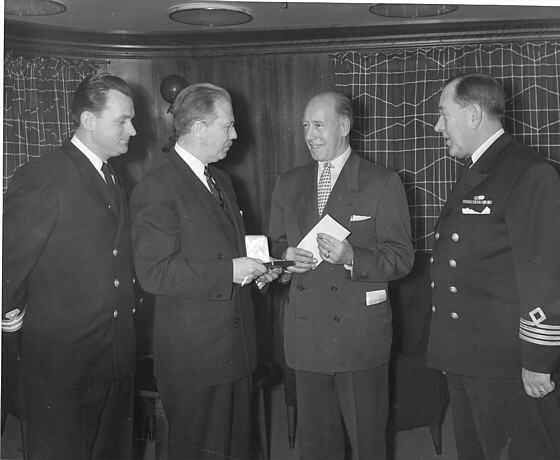 Curt Dawe, Chief Steward Stig Lundgren, and Bartender Kurt Eriksson. 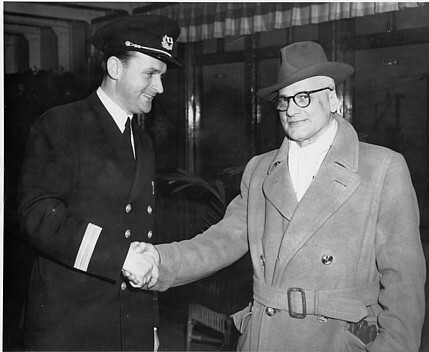 Tage Rutgersson started his employment for SAL in the dining room on board the Drottningholm in 1920. 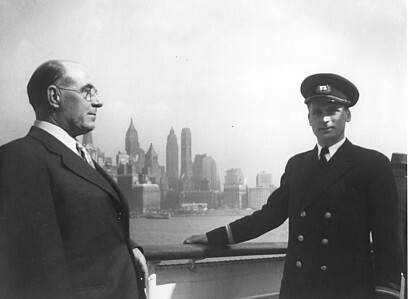 He served on two maiden voyages, the Kungsholm of 1928, and the Kungsholm of 1953. He was most fond of the Kungsholm of 1928. "There was something extraordinary about her that is impossible to forget. I especially remember the two level dining room. You almost had a heat stroke down by the equator, but it was something else than the modern dining rooms with just one level to facilitate air conditioning." The Chief Purser's office, 1973. Which ship? Swedish art above the sofa. D223. Sometimes it's just as well to stay inside.